The AVSIM Basic FSX Configuration Guide provides members with a one-stop guide for configuring FSX for optimum performance. Our goal at AVSIM is to make configuring FSX as simple as possible and to educate. There are many FSX Configuration Guides published around the Internet and a member only has to do an Internet search using the Google or Bing search engines to find them. The Microsoft-owned Flight Simulator is possibly the game industry's longest-running continuous franchise. The first Microsoft-branded version was released in 1982 with the most recent version, FSX, released in 2006 and expanded in 2007 with the release of Acceleration/SP2. FSX is a 32 bit application that can reside in a 64 bit Windows operating environment. 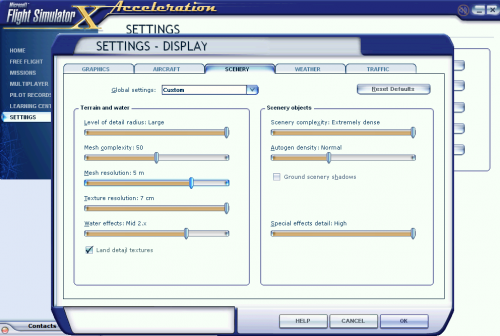 Acceleration and the freeware version SP2 included a preview to DX10 technology as the Microsoft team did not have sufficient time to completely program FSX for DX10. They had hoped to finalize development in a future update (as well as improve on the FSX engine) but the development team (AKA Aces Studio) was released by Microsoft before those upgrades could be published. Currently, an add-on developer has fixed many of the issues left behind by FSX. You can get more information about DX10 in our DX10 Forum. UIAutomationcore.dll tweak, link to version that needs to be installed in main FSX folder if using Windows 10 or 8.1.
information to best tweak AI programs. images for each FSX setting. very good article, I recorded ..... it will part of my checklist before any flight. Why is everone else's Nvidia Inspector different than mine? Mine doesn't have the exact settings that it says to put but instead is a bunch of mess in all caps. We hope to include suggested P3D settings in an update. Why am I not allowed to download this anymore? Great article, I just my new pc and using FSX SE this article also work fine, thanks guys!! Thanks a lot,your guide is very helpful! I bought the original version for my Trash 80 in 1980 - Sublogic (Before MS acquired them) - $25 on cassette tape. It was a 6x6 grid. Then it duplicated although you saw no graphics until it was a full 36x36. Take off, fly North and eventually you emerged south of your takeoff point. thanks for the work, Jim....but i cannot find anything describing what changes exist in the update. In fact, the version I just downloaded still shows version 1.0.0.0 with a November 2013 date. This a great addition to the FSX tutorials I created years ago, and still use. we recommend a setting no higher than 40. We do not recommend anything higher than 120. So is 40 or 120 the highest recommended? We do not recommend anything lower than 20. If you have a very modern overclocked system (an Intel i7 or AMD comparable), we recommend setting this parameter to 0 (unlimited). So, if 20 is the lowest setting recommended, then why recommend a setting of "0" a few sentences further? I hope you understand my confusion. Again, I really appreciate the effort put in to providing the updated guide. Thanks for your comments. When you first install FSX, the default is 24 or 25 fps. Most have been successful at 30 fps so why we recommend that. For unlimited FPS (100 FPS or higher), the parameter is 0 in the FSX.cfg. I suppose I took for granted that everyone knew about FPS and the parameter settings in the FSX.cfg. I have had my FPS as low as 20 but, at one time, when FSX was first released, it was very difficult to get FPS over 15 and many lived with FPS around 10 to 15. So computer performance has increased considerably. Texture_Bandwidth_Multi=40 is the default for most settings but many push this up to as high as 120 which which we do not recommend. What I was saying, keep this setting at 40 but, if you raise it as many websites and supposedly "experts" recommend, do not raise it any higher than 120 as it will tax your system. You may think at 120, it makes things look great but that is in one area. Move to another area or a different commercial scenery add-on and your textures may be struggling. It is something that one can play with to see how it looks on their system. What I like about your questions is the fact you took the time to see these "contradictions" and did not just scan over the information and that's good. But they are not contradictions. Just my miserable way of communicating. I think, if you look around the Internet, you'll see similar comments as I have made in the guide. You also have to understand the settings recommended in the AVSIM Guide are "Basic". I just wanted something where new members or those who just took up the flight simulation hobby could set up their systems and get up and running much faster with the guide. No. Some use the AffinityMask tweak to try to make this happen but we do not recommend that with the powerful computer systems of today. I think you will enjoy the game much better when you have your fps set to render objects quickly and I like your setting. You may see some anomalies but then you will see anomalies with fps set even higher or the "blurries". Thanks for your comments. Is it OK to use [JOBSCHEDULER] AffinityMask=14 on FSX.cfg? What would be the advantage? If you start up FSX and while it is loading, click on your Windows key + R, type in Resmon, and then look at the Resource Monitor and check the box next to FSX.exe (leave all others unchecked), then click on the CPU tab and look over to the right and you will see everyone of your 8 cores is running at 100%. Can't get any better than that! There have been many CTD's with this "tweak" in the fsx.cfg. Back in the duo-core days and previous versions of Windows, this tweak might have helped as only one core was running. Now they are all running. Cool stuff! There have been many CTD's with this "tweak" in the fsx.cfg. Thanks for your great help on this. But I had OOM without the AffinityMask not sure if because of windows 10 fall creators. Then you would want to check out the latest AVSIM CTD Guide located in this section. An OOM with a 32 bit application is very common.